This my first GeekList! I'm just now getting into the hobby, but already am having a blast with my kids (both girls). Planning to use this list to keep track of the Children's games we play as a family. The goal is to update each item as the kids age to help show how age affects enjoyment of certain games. Being that I'm pretty new to the hobby and BGG, I would love suggestions! 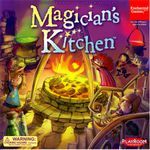 The rankings on BGG for Children's games aren't very helpful, as many rate them poorly from an adult's perspective. 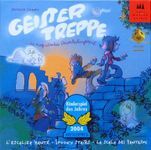 I plan to go through the nomination lists from the Kinderspiel des Jahres and Kinderspielexperten 5-9 as well to get some recommendations. An instant hit! Low price, great art, fun gameplay = winner. Well...this was not the success I had hoped. Both kids seemed pretty frustrated with it. I'll keep it on the shelf and try again later. Z-Man just republished this in the US as "My First Carcassonne," and I'm glad they did! Been waiting on it for quite awhile... As expected, it's well produced, with thick, sturdy tiles and chunky meeples. The art is wonderful as well. How did they like it? The US version is called "Brandon the Brave." We've played a few times now, and the 3yo has one every time (with a little guidance) Seems to be a hit with everyone. Has elements of Carcassonne, very light decisions. Great art and theme. Roundly enjoyed by all! Fast-paced, exciting, and usually has us all laughing by the end of a round. OK, here's the deal. I've been holding out for a re-release of Kids of Carcassonne for months. Supposedly they will do so sometime this year. But here's what happened. My 5yr old saw Mom and Dad planning the base game of Carcassonne (with River exp). The next day, she told me, "Dad--I WANT to play that "castle" game!!!!" So, I figured, what the heck, let's try it. I decided to simplify it by removing the Farmer aspect completely, focusing only on Knights and Thiefs. We also made cities worth only one point per tile (plus shields), so that my 5yr old could count up points easier. End result? She LOVED it! She even got our 3yr old playing (although she quits after a few minutes ). Now, I see no reason to pickup Kids of Carcassonne -- we'll introduce the real scoring and Farmers when she is able to understand them better. Our absolute favorite right now. Beautifully designed with high quality pieces. The kids adore the cute little mice and the funny cat. This is the first children's game I've played that has an element of real suspense, as you never know when the cat will suddenly go on a rampage! A pretty fun memory-style game. The kids like the funny artwork and the theme of banishing monsters is very appropriate for their ages. The rules state that you must say "get back in the closet, monster!" (or somesuch) when sending a monster away. We added an extra house rule that requires an additional descriptive jab, such as "get back in the closet, you polka-dot bellied monter!" Adds a bit more fun to the game and lets them be a bit creative in the process. Definitely not a brain burner, but fun and short enough that it doesn't wear out its welcome. I was able to find an out-of-print US version of this called "Boo Who?" As far as I know, gameplay is identical. The kids love it - this is another that usually ends with everyone in laughter. 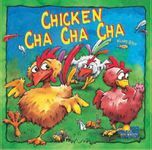 Like Chicken Cha Cha Cha, adults don't really have an , as it's a memory game at heart. Usually by the end of the game, no one has any idea where their piece is, especially if you play at a fast pace. 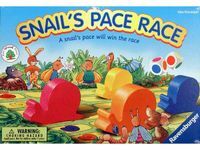 Still a bit too competitive for our youngest (I picked up Snail Pace Race for her for that reason...more on that one later ), but the eldest loves it. The games are quite quick so it doesn't have time to get boring for the adults. An interesting dexterity game. The kids both enjoy it, but the adults find it a bit boring. Kids also tend to get frustrated easily by the invisible stumbling stones. Played this for the first time tonight--kids loved it! A good example of a game with low production values that's still a joy to play. This is the first co-op children's/family game we've played, and I really enjoy this style. My eldest has especially gotten very competitive lately with the other games we play, so it's nice to have a shared experience. Definitely helps the younger one feel more included. For such a simple game, there's actually a decent bit of decision making, too. Should we go ahead and lure the cat back to the house now, or risk another roll or two before using up a treat? Which animal should we move this time--should we move one two spaces, or two one space each? The perfect amount of analysis for our eldest. Will be curious to monitor the replay value. A great idea for a memory game. Excellent components, with big fat chickens that are easy for the kids to move around. This is another example of a game where adults do not have an advantage. In fact, kids may have an advantage with their sharper memory. Our 5yo routinely destroys us! The 3yo is still a little young for it. Her memory is fine, but she does *not* like the idea of someone stealing her tail feathers. She'll actually pull her chicken off the board and hide it when someone gets close to her! 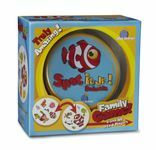 A fantastic dexterity game. Another that everyone enjoys. Games are short and there's lots of player interaction. Not a Children's Game, however there is a preschool variant in the rules that removes all the Action cards and essentially makes it a simple dominos game. We actually enjoy this quite a bit with adults as a light game as well. I didn't think my eldest would be able to play this game. She saw the box in the closet and demanded to play the "penguin game"! So, we played, and she loved it! Obviously she's not playing several moves in advance or strategically placing penguins at the start, but she loves the components (I actually just ordered the much nicer deluxe version for that reason) and gets a kick out of stranding dad's penguins on small ice floes. 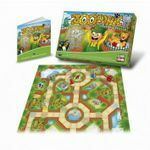 This is a great game to grow into, as it can be played on several levels. I picked this one up to add more age-appropriate games for Kid B. I think it's a bit too simplistic at this point, however. She will play it occasionally, but definitely not her first pick. I would say this is best for 2-3 year olds. Not surprising that this is very boring for adults. I'd rather play CandyLand. I've only played this one with Kid A @ 5yrs. It's too much for the younger Kid B (3yrs)--she'd rather play Viva Topo or Animal Upon Animal! Mom and Dad despise this game! It takes forever to play, and often you simply wait many turns trying to roll the perfect number to land on the tile you need. I avoid this one at all costs. The kids like it pretty well, mostly because of the cute art and the theme of helping animals. Kid A (5yrs) likes the animal artwork and seems to enjoy playing, but doesn't really have a feel for the strategy (or doesn't care and just likes placing the chips). 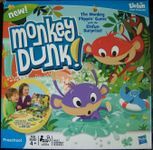 Really easy for adults to win this one, compared to a game like Viva Topo or Animal upon Animal where the kids actually have a good chance! We've got a thrift store version from the late 90's, but I guess they're all pretty similar. This is one of those common retail store games that gets a lot of play. It's simple, there's no decisions to be made, but it at least teaches kids how to take turns and how to win/lose graciously. Also a bit of a lesson on cause-and-effect through the positive and negative consequences of different actions. Another common retail game like Chutes and Ladders. Ages quickly. The board itself is lively and cutesy, so it probably gets more play than it would otherwise.